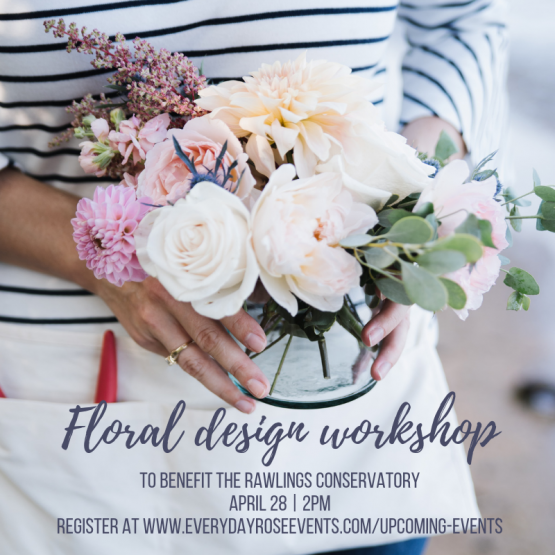 Join us for a floral workshop and fundraiser to benefit the Rawlings Conservatory. We will provide you with all materials – vase, foliage, flowers, and use of floral shears to create your own arrangement to take home! – Flowers and foliage to create a unique arrangement. We will provide you with a “recipe” card to help you get started. $10 of every ticket sold will be donated to the Rawlings Conservatory. Deadline to purchase tickets is TBD. Limited spaces available. Please note: Registration for this fundraising event is non-refundable. Tickets may be transferred to another attendee. However, refunds will be given if the event is cancelled by the organizers for any reason. Proceeds supports the Conservatory – we thank you for your understanding and support! This special fundraising event is presented by the Friends of the Rawlings Conservatory, the 501-c-3 non-profit support group for the Rawlings Conservatory. Proceeds from this evening will help support and preserve the Howard P. Rawlings Conservatory, Baltimore’s architectural and horticultural gem, for future generations.